Answer: We do what we did in 2010. The Bible says one will put a thousand to flight, but two will put 10,000 to flight. (Deut. 32:30) In other words, when we are united our power and effectiveness increases exponentially. The 2010 Republican sweep of the elections driven by the Tea Party confirms this truth. 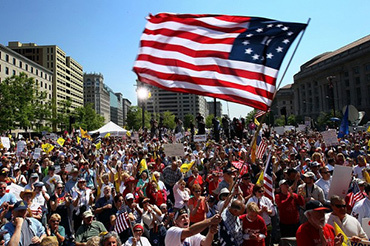 Without mainstream media support, We The People used the resources at our disposal (internet, talk radio, social networks and a single minded purpose) to spread the word which inspired 1.7 million patriots to show up for a rally in DC. Incredible. Absolutely amazing! Well patriots, it is time for us to work together again. In a single-minded effort, We The People must unite as an army fighting side-by-side determined to repeal Obamacare. Obama said repealing Obamacare ain't happenin' on his watch. The GOP and many political pundits agree. Meanwhile, Obamacare is wreaking havoc on America. I refuse to believe that the American people will sheepishly allow this evil and destructive behemoth, pushed on us via Obama lies and dirty political tricks, to stand. Patriots, 2014 has to be our all hands on deck effort; getting as many conservatives as possible elected to the House and Senate; exploiting every opportunity to push back against the full implementation of Obamacare via lawsuits and more. Also crucially important, we must stand by our Tea Party warriors; Ted Cruz, Mike Lee, Sarah Palin and others. Courageously enduring unimaginable pressures from the GOP and the left, this is not the time to nitpick our generals for being less than perfect. We are at war! In the early years of the Tea Party, I was blown away by the brilliant minds I encountered at rallies across America while touring on Tea Party Express. Patriots wrote books, conceived strategies, organized, wrote songs and more; all intended to take back America. We need that same intense creativity and energy activated to repeal Obamacare; stopping Obama's vowed insidious fundamental transformation of our great country. Our unified desire to repeal the monstrous Obamacare must be the catalyst for rejuvenating the early passion, enthusiasm and determination of the Tea Party. This is it folks, 2014 is the year of the battle to end all battles for America as intended by our Founding Fathers. As for the odds, the traitorous GOP, the left and big money being against us, such has always been the case. The only thing different about the 2014 election is that establishment Republicans are no longer hiding their disdain for the Tea Party. Therefore, if we do what we did in 2010, We The People will defeat them again in 2014. One last point. From its beginning, I believe the Tea Party was divinely inspired. How else can you explain mega millions of Americans becoming mobilized to act because of one man, Rick Santelli ranting about the size, irresponsibility and tyranny of out-of-control big government. Thus, I believe we have righteousness (the moral high Ground) and God on our side. "If God is for us, who can be against us?" (Romans 8:31) This truth gives me peace and my spirit to remain upbeat and confident. Patriots, your lives have been prepared for such a time as this. The Tea Party is the miracle cure destine to eradicate this evil cancerous tumor known as Obamacare, aggressively eating away at the soul of what it means to be an American. 2014 is the year we heal our land.